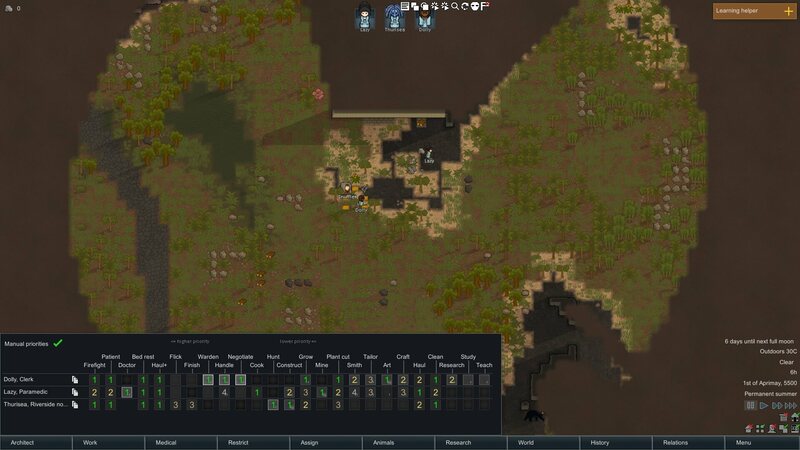 Welcome to the second of our RimWorld guide topics, covering some of the essential tasks you should complete when you first found a colony. As soon as you land on the planet and can see your colonists, pause the game. All of your resources will be scattered about the map, but they’ll be forbidden to start with, which means your colonists can’t pick them up or interact with them. To fix this, go into the first tab at the bottom of the screen, ‘Architect’, select ‘Orders’ and click ‘Allow All’ (or use whichever allow tool you have available — some require click and drag). Now you’ll want to give your colonists weapons, so select each colonist (either with their portrait or by clicking them on the main view) in turn, select the ‘Character’ tab on their info panel and check out their top two stats. Give any ranged weapons to the best shots and any melee weapons to those with the best melee stats, by right-clicking the weapon with them selected to make them pick it up. If playing with the Fog of War mod, early exploration is vital to finding resources. 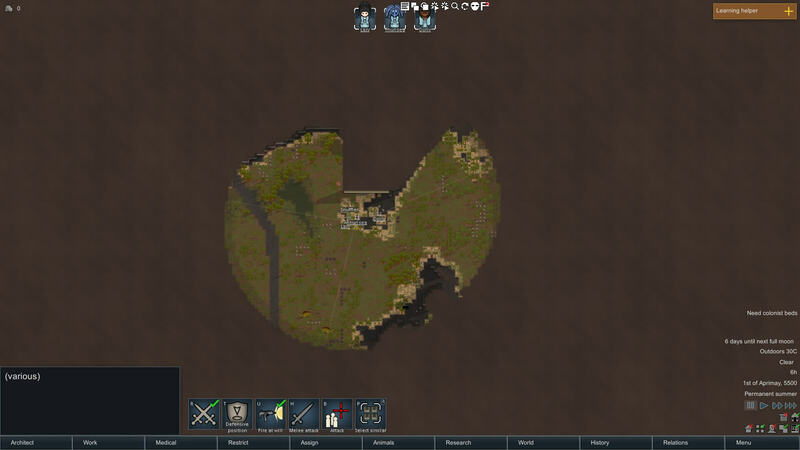 The next thing you want to do, after letting your colonists eat some food and vomit a bit, is check out your local area for an ideal base-building spot. If you’re playing with the Fog of War mod, this means drafting each colonist (click the crossed swords icon with all of them selected) and sending them off to each corner of the map to reveal the area. If you want to speed up time during this process, numbers 1, 2 and 3 control the speed. The spacebar pauses the game and number 4 can be used as a special speed to get you through the night. What is an ideal spot for a base, anyway? Well, it very much depends upon your chosen map square, but aim for an easily defensible spot — a clearing surrounded on many sides by mountain or river. Be wary of choosing a spot too near water, marsh or mud, as you won’t be able to build on these squares until much later in the game, after a significant amount of time has passed. When you’ve chosen your spot, build a small wooden hut, preferably against the side of the mountain to preserve wood. If you want to plan ahead, check out the Laying out Your Base section below, but for now, this little room will be your barracks. Make it big enough that all your colonists can sleep there with extra space, but leave some wood to build your store room. 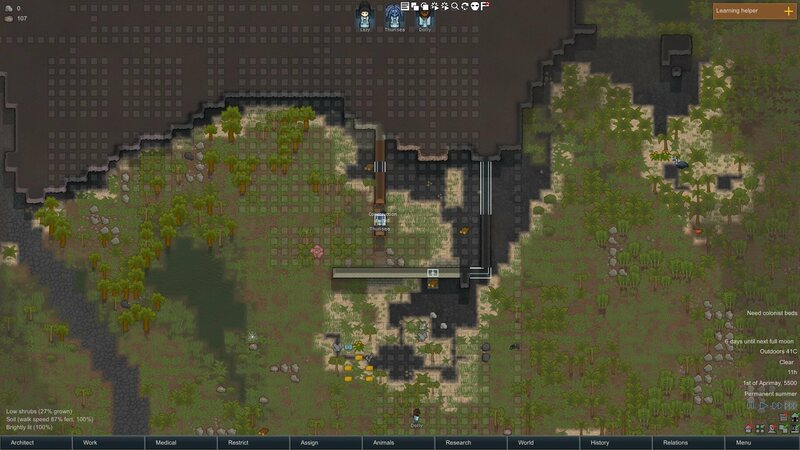 Building against existing walls is a good way to save resources in RimWorld. While you’re building this, you may notice half-built buildings lying around the map. You can always choose one of these as temporary (or even permanent, if close to your base location) sleeping quarters by bricking up holes in the wall. To build things, just head to ‘Architect’ -> ‘Structures’. 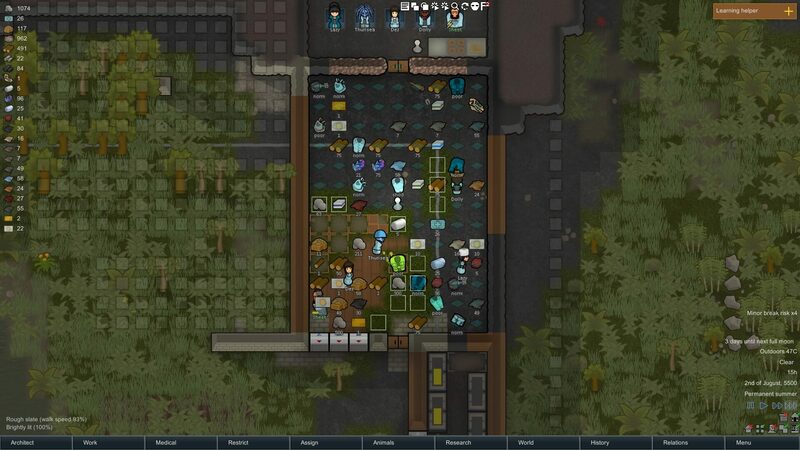 Sleeping spots for your colonists are in the ‘Furniture’ tab, to make sure they don’t sleep out in the rain or scorching heat, where animals can chomp on them. In reality, this should be one of the first things you do, but we didn’t want to confuse you right off the bat. Click on the ‘Work’ tab. You’ll see a list of colonists with tasks as columns and ticks under which your colonists are assigned to do. The problem is, your colonists do these in priority order from left to right. If there’s always something to cook, they’ll never clean. So what you need to do is set up manual priorities. To do this, just click the manual priorities toggle in the top left of the work screen. The ticks change to numbers. Right-clicking a number decreases its priority (from blank and 4 through to 1, where 1 is the highest), while left-clicking increases it. You want everyone apart from your doctor on 1 for firefight, patient and bedrest (and haul+ if you have the mod). Your doctor goes on 2 for the first two, then 1 for doctor, then follows everyone else. This makes sure they always prioritise tending to illness and injury. Make sure you have an even spread of skills, if you can — someone should be on-hand for each vital task. After that, judge priorities by who is most skilled, which you can see by which boxes have the brightest border. At the beginning, constructing, mining and growing should be top priorities, with hauling given some notice. These will shortly be joined by all-important cooking and cleaning when you build your base. Before you don your construction hat, however, take some time to work out where you want to put the essentials. For somewhere to store non-perishable resources or junk like stone chunks and blocks, set up a dumping stockpile (using the tool in the Zones tab of the Architect) out of the way of where you’re going to build, but close enough that your colonists can get to it without walking too far. Though steel is valuable, it doesn’t decay outdoors, so you can dump this here as well. You need to take more care with perishables. At the beginning, you can probably store them in the same room as your colonists sleep, converting it to a temporary store room until you build a bigger one as part of your base. If you need more room before then, use your freezer to store both food and other resources. Food is more important to keep around, so before you build anything else, build a kitchen and a freezer. Aim to build the freezer at the edge of your base, connected to the kitchen on the inside, and leave room for both power generation and a dining/recreation room, if you can. It can still take ages to put together a kitchen and it often serves as a store for other items for quite some time. The most important thing to do is keep it cool and under cover. A good size for the freezer is about 10×12 squares, or something of similar area, as this leaves room for a decent emergency stockpile, enough to see you through blights and other harvest failures even with a large number of colonists. The kitchen is best attached to one end of this, the same width as the freezer and around four or five squares deep if you want room for more cookers later. Build one door leading to the kitchen and one leading to the outside, then (from the Temperature tab in Architect) build two coolers on the outer edge of the wall. You’ll see a blue square and a red square on either side when you try to place it — make sure the blue square goes on the inside of the freezer. After that, set up a stockpile just for food, animal corpses, medicine, drugs and body parts and you’re good to go. We’ll talk more about how to power your coolers (and where to move medicine and corpses) later on. For now, it’s just important to have an enclosed food storage area.